This entry was posted on Monday, November 15th, 2010 at 5:00 am	and is filed under Childhood, Choices, Relationships. You can follow any responses to this entry through the RSS 2.0 feed. Both comments and pings are currently closed. You certainly said it. Loss comes in so many forms. I’m glad you had the opportunity to buy your beauty back, and to be with her as an adult when you would return home. I am happy for you – for the wonderful times shared and all you learned together, for her good long life, and truly sorry for your loss. Oh, I’m so sorry, Gale. I was a “horse girl” too and spent many weekends on the back of a horse named Big Red. I’m sure Sundae knew how much she meant to you. That relationship helped make you the you that we all love – gentle, caring, responsible, and so full of love. God bless Sundae and her very special friend. Gale, I’m so sorry about Sundae. Reading this beautiful story makes me think of my childhood dog, Snoopy, and the great void when he died. It’s amazing how pets work their way into our hearts (although Sundae was more than a pet in many ways). Especially as adolescents, we spend so much time during those formative years with our pets. To say goodbye is like letting go of that stage of your life. 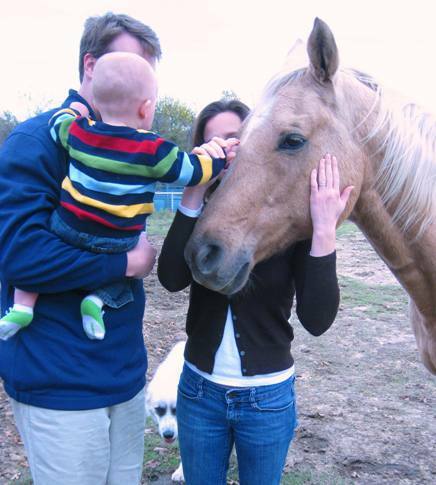 What a precious photo – I love that your horse and your son got to meet! Gale, I am so sorry for your loss. Sundae will always be in your heart! I am so sorry for your loss. I can tell from your words here just how much you cared about Sundae. It does sound like, thanks to you and your family, she had a wonderful life. I love learning new tidbits about you and what a great picture, too. Oh, I can so remember all the time you spent with Sundae…selfishly, I remember because I was often dragged along. I remember wishing I had that level of dedication to something like you did. She was a beautiful horse, and you were always beautiful riding her. The farm won’t be the same. Gale, I’m sorry to hear about Sundae and your loss. There is something about folks and their horses. I know many and the way you said it, “We each fell back into our old rhythms easily, as old friends do” really sums up how I see each of their relationships with their fellow horses. and i know exactly what this kind of loss feels like. mine is the perfect shape of a violin case.